Im happy with my stopping point on 1.10, I will now start updating to newer versions of MC. There are some rewrites that will happen. most of my latest code is already prepped but some of the original will needs to be rewritten to make updating less of a hassle. Update to inventory system.. no longer uses IInventory, now uses capability system. MAY LOSE SOME ITEMS STORED IN THEM. Only on first load. Create string from feather fibers. Proper icons and registering of the tile entities for jei. Lucky egg machine can now except items and power from the top block as well as the bottom. Fix fertilizer mixer not accepting manure, but you still cant place a hopper underneath it and pull from the output slots. Fertilizer mixer now accepts single use fluid items. Hotfix crash with fertilizer mixer issue and its tile entity. Crashes happend on world reloading. Other things you will noticed is some new Upgrades (Not Working) Had to get this hotfix out first. 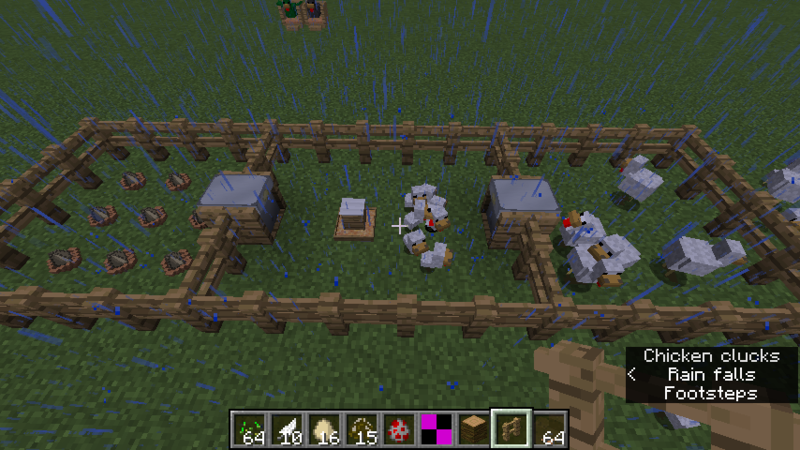 Updated Animal nets to no longer try to add a chicken to a pen that already has a chicken. Animal Nets were acting funky when in Creative mod, so now if you use a net it just creates a new net with your captured chicken. Shredder should be working now. Shredders will also pick up items like hoppers if thrown on the ground.. currently only feathers can be shredded, and will support craft tweaker in the future to add more items. The nesting pens placements should be fixed now..
Added Shredder, not 100% but it works, Servers are still a bit funky. The One Probe should be re enabled. Currently supports nesting pens and egg nest. Chickens in nesting pens should no longer be taking damage, chickens should no longer die or pretend to walk around playing sounds on your ears. If you have no idea what I'm talking about than don't worry about it. Also this is a trial run, I may optimize this more. Start of a new Block, Feather Shredder will allow players to shred feathers into feather fibers and feather meal. Will be used for new items. Not actually usable yet. Just has the block and animations. Fixed Animal nets not removing chicken name when placing in a nesting pen. Added new new (WIP) machine (Fertilizer Mixer & Methane Generator. These blocks are final and will be changed, fixed, updated.. all the above. needs to be able to see chickens to mate. Blocks had some increased hardness. Now internally handle chickens wing flapping inside nesting pen. Will use to have more control. Sorry for the quick fix, but realized jei was displaying wrong information for nesting pen drops with "Chickens mod"
Hatchery Eggs have been oredic to work with harvest craft recipes. Removed about of unused code, and Unneeded code. Added Catch to prevent clients crashing when connected to DS and during death screen. Fixed some Syncing issues causing Crashes between servers / clients. 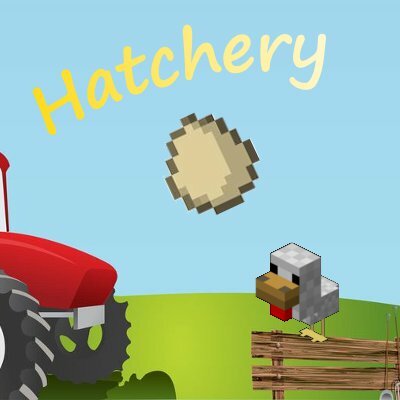 Added a catch into hatchery in-case server and client desync and cause the egg creation to crash the game. Made the nest block not able to be collided with. Because of the new DNA stats, Hatchery Eggs wont stack as often. When you stats get maxed out they will always stack. Added support for all pipes, or hopfully most of them. Thanks Kash! Fixed Animal Net spamming console. Eggs have been changed slightly to remove the hard coded egg colors to a more dynamic color chooser. this will help with mods like Chickens & More Chickens. Currently those are the only too mods that are supported for this colors. Fixed the chickens not matting in the nesting pens. Happened while trying to fix a Crash bug in the last update, My bad. Chickens now Drop Manure when free range chickens. Chicken Feeders now have a visual on how full they are. Fixed Eggs not displaying correct colors when breeding chickens not in a nesting pen. Added new Egg Colors for More Chickens update. *Nursery Monitors example to use it to go from egg to adult.. than to where ever you like. HotFix for a dupe bug with buckets.. its fixed. Updated Textures for Fertilized Dirt, & farmland. Also updated Manure block slightly. Also updated Json models so things didn't look so messed up. Added fertilizer bucket to the hatchery creative tab. It wasn't show up before. Updated Recipe for Sprayer to include Fertilizer bucket. Updated Forge to version "1.10.2-12.18.2.2099"
Nesting Pens will now look for Nearby nesting pens with chickens, If it finds a chicken you get a will always get an egg ever 5 mins. Chickens by them self still have a random chance to get an egg but its not as often. New Animal Stats Capability currently adds in When they will eat. Chicken Feeder was updated to use new capability. Chicken Feeder effect is no longer stackable. Fixed the offset of the chicken nest when a egg hatches, chickens no longer spawn so high and will spawn directly over the nest now. Chicken feeders Keep Inventory when block is broken. Chicken Feeder now has a recipe.. derp! Issue with Chickens Duping and not being able to place chickens in pen if you break it. Any pens that weren't allowing to place a chicken in after this update, just break it and replace it. This broke to how vanilla handles blockstate when switching. It considers it as the block is breaking when all I did was change the the state from chicken to no chicken. So it would dump its inventory when adding a chicken.. that would drop a second chicken.